Along with spending time with a number of the patients, Bass walked through the halls pulling a wagon filled with goody bags that he delivered to kids upon each visit. He also took time to take photographs, sing Christmas carols and hand out autographs. But Bass wasn’t the only one doing the giving. A young girl inspired by the Magic player’s visit, took time to illustrate a drawing and construct an ornament for Bass that he was more than happy to keep. The Christmas season is a special time for Bass, who has experienced first-hand both the ups and downs of the holiday season. He vividly recalls “great Christmases” when he was younger, once receiving a 10-speed bike and spending time with his mother before she passed in 1995. Afterwards, the season became a little tougher as he and the rest of his family moved in with his aunt, who had to provide for five children of her own. Now, he relishes the role of making the holiday season special for patients at the hospital and his own family. While Bass doesn’t have any set plans for the holidays this year, he does have one Christmas wish. 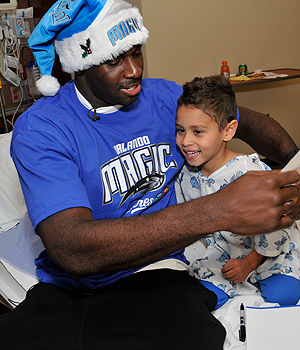 And that’s one gift that would bring smiles to Magic fans’ faces across the globe.